Usually, Anubis is portrayed as the son of Nephthys and Set, Osiris' brother and the god of the desert and darkness. One myth says that Nephthys got Osiris drunk and the resultant seduction brought forth Anubis. Yet another says she disguised herself as Isis and seduced Osiris and subsequently gave birth to Anubis. 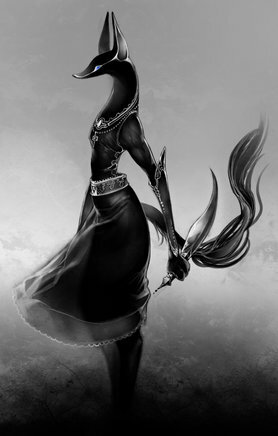 After his birth, Nephthys left him in the Necropolis where he was raised by jackals. After Osiris was killed by Set, Anubis became Isis’s faithful companion as she searched for Osiris’s body. During the search, Anubis invented embalming and mummification: Osiris was the first mummy. Osiris' organs were given to Anubis as a gift. With this connection, Anubis became the patron god of embalmers: during the funerary rites of mummification, illustrations from the Book of the Dead often show a priest wearing the jackal mask supporting the upright mummy. He is the guardian of the door through which the deceased enter the hall of judgement. He leads the soul to the field of celestial offerings. He presides over the weighing of the heart ritual: the ceremony of judgement that determines the soul’s fate. He himself places the heart on the scales of justice and personally feeds the souls of those who fail to pass the test to Ammit, the monster who devours them. He supervises the mummification process ensuring that it is ritually correct. He supervises the opening-of-the-mouth ceremony, the ritual which ensures reanimation of the soul. Egyptian priests wore jackal masks, possibly channeling Anubis. Romans venerated Anubis, where he was considered protective and he was invoked to help with curses. Anubis opens the path allowing spirits and humans to travel between realms, and will serve as a guide if requested. He will stand guard for you. Point his image in the direction of what must be protected or from the direction that danger will emerge. Anubis knows the date of everyone’s death and may be petitioned to reveal it. Anubis locates lost articles but only if you have a statue of him; touch his ears and request his help. Anubis guards the dear, protecting against grave robbing and desecration. Anubis may sometimes wear the mask of Saint Christopher. FAVORED PEOPLE: Mediums, diviners, and those working in the funeral industry; Anubis protects children. MANIFESTATIONS: A black jackal or hound, a man with a jackal’s head. ICONOGRAPHY: Although he is called a jackal, he is not portrayed as a realistic jackal, the Egyptians were not interested in realistic portraiture, but in conveying spiritual and mystic truths via color and image. EMBLEM: Bloodstained black and white ox-hide hanging from a pole. OFFERINGS: The Ethiopian jackal is extremely endangered; offerings on its behalf or on behalf of Pharaoh Hound rescue may be appreciated. On your altar, or in a funeral home or cemetery offer Anubis beer, wine or spirits and give him macabre funeral and death themed toys and figures.